I am a retired nurse rediscovering my artistic roots. I make handmade cards, and sometimes include small works of art on my blog as well. 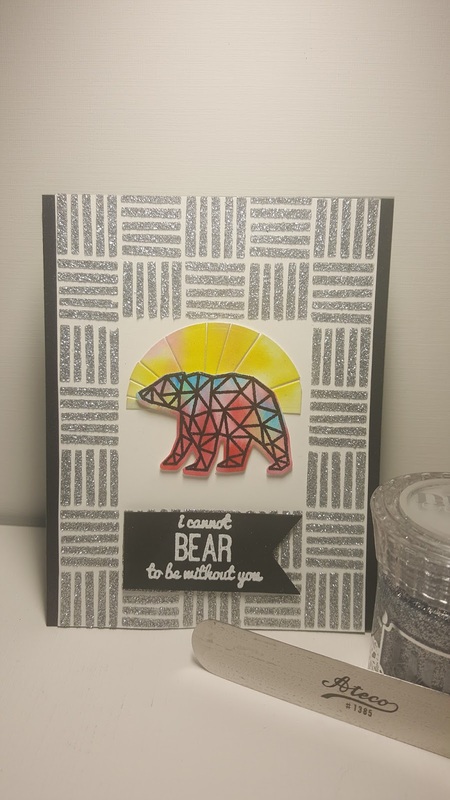 I will provide a primary products list and a description of the techniques that I used to make each card, and give credit for layout or design of a card if not of my own unique creation. Got my new order from The Ton Stamps and just had to make a card for their June Color Palette Challenge (gorgeous colors)- see image below. 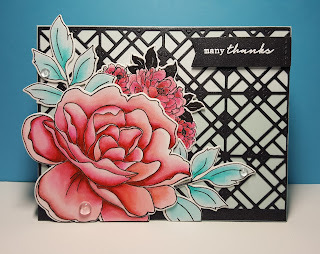 My card used the Large Peony 5 stamp and dies, the Peony Cluster Mini Stamp/die, and their Geometric Lattice background die in a shimmery black card stock, and the sentiment banner die was from MFTs dies. I water-colored with Zig Clean Color Real Brush Markers and heat-embossed all the images in black. 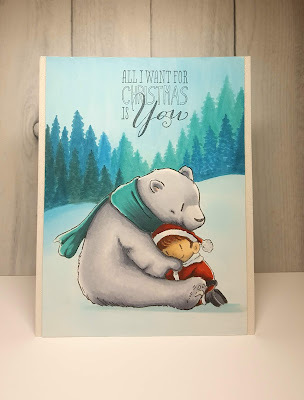 Background watercolor paper from Stampin' Up! 3 Dew Drops finish off the card. On assembly, I decided the card needed a little shimmer, so I added a diluted layer of Ken Oliver Craft's Liquid Metal in Metallic Rose to the Peony mini clusters only. Then I was satisfied. Here is The Ton Challenge, Color Palette for June, from their Blog. 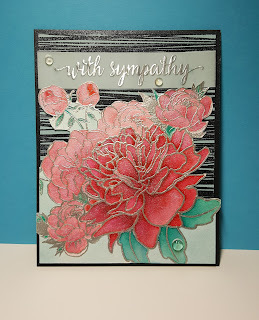 With my peonies in full bloom, I thought I'd color some peonies with some of my favorite peony stamps from The Ton, and enter their June color palette challenge. 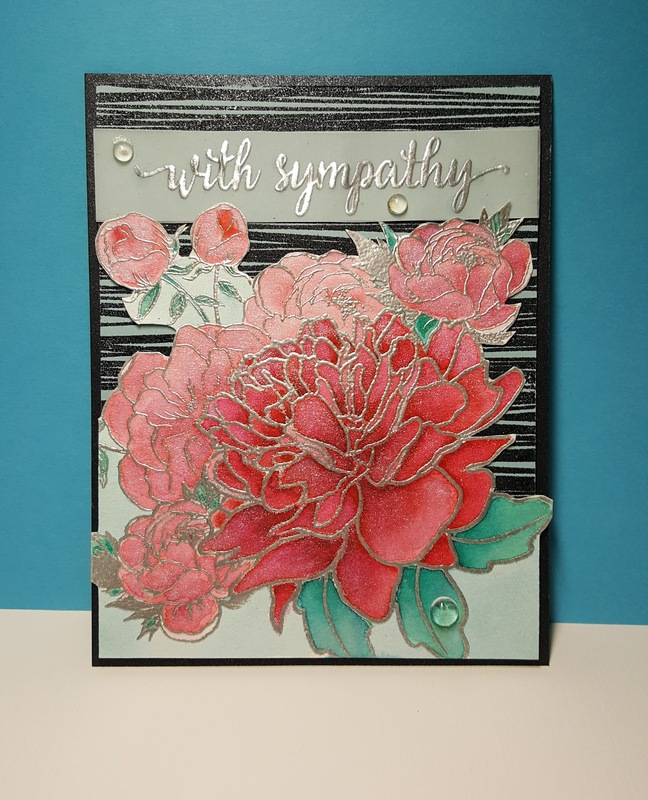 This card used all Ton stamps, from the peonies, to the background stamp, and the sentiment and embellishments. 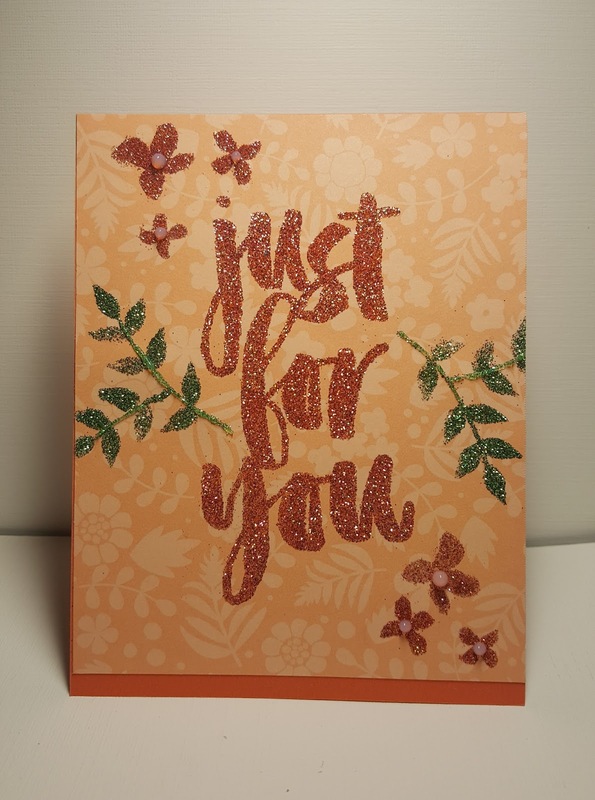 I heat embossed the image and sentiment in WOW super fine silver embossing powder, and used their black glint embossing powder on the background stamp. I water- colored the image with Brusho pigment powders, but the color was not quite right, so I touched up the color with some Zig Clean Color Brush Markers. I finally added some shimmer with Ken Oliver Craft's Liquid Metal to the flower petals. I fussy cut the top portion of the flowers and mounted it on the black embossed light blue card stock, then foam mounted that onto some shimmery black card stock. 3 glass slippers from The Ton finish off my card. 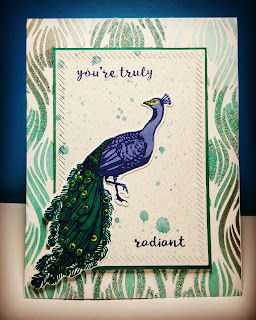 My favorite card of the bunch, this elegant Peacock color-layering stamp from Hero Arts, all new products for me on this card. Applied the Ranger Texture Paste sparingly, then sprinkled WOW embossing glitter to it while still wet. *Peacock die cut and mounted on NSW #110 lb. 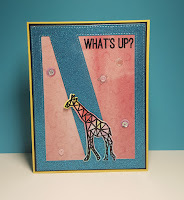 card stock die cut with My Favorite Things Dienamics - In&Out Diagonal stitched Rectangle STAX that was first spritzed with Altenew Shimmer Spray. then foam-mounted on top of the background panel. 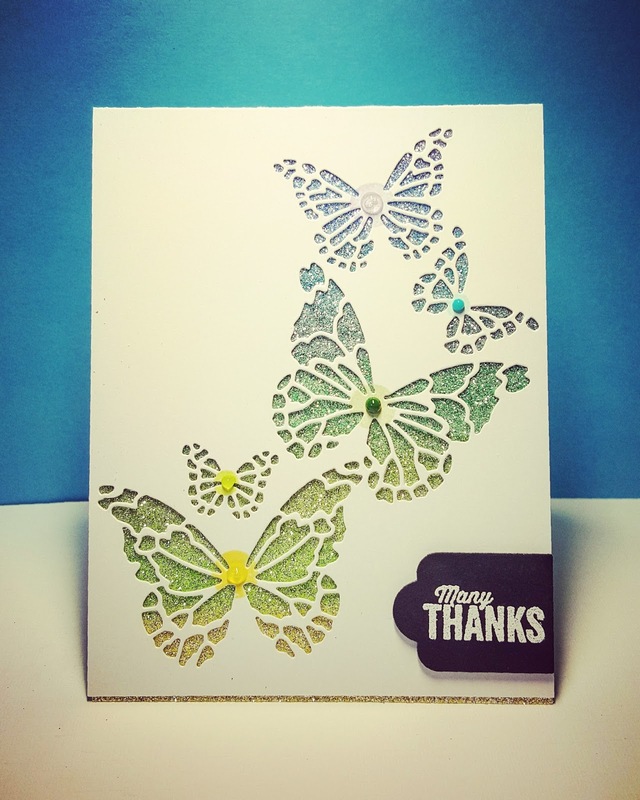 This simple card uses the Reverse Butterfly Collage die from Memory Box adhered to glitter paper that I colored with Copic markers, blending them from yellow-green-blue to purple. I then stamped a colored dot in each butterfly body area in similar rainbow fashion an placed a Nuvo Crystal Drops of similar color on top of that. The sentiment and banner die are by Stampin' Up! This was my last card that I completed for the Online Card Class- Sparkle and Shine. WOW super fine Bright White embossing powder to sentiment from same Altenew Stamp set. Banner Die from Stampin' Up! 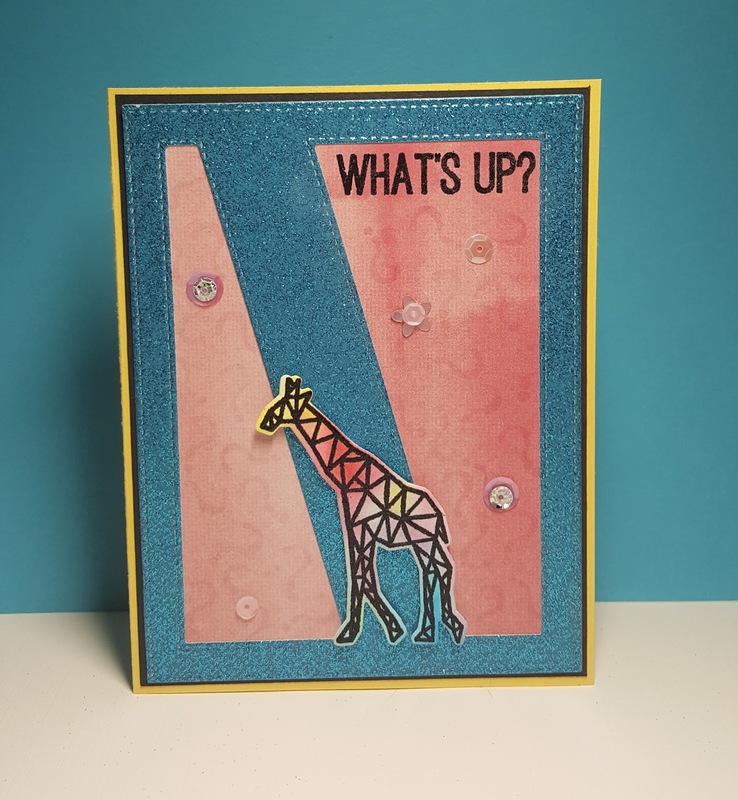 These two cards used a My Favorite Things die (stitched CU Comp-Diag.) in both the vertical and horizontal layouts. 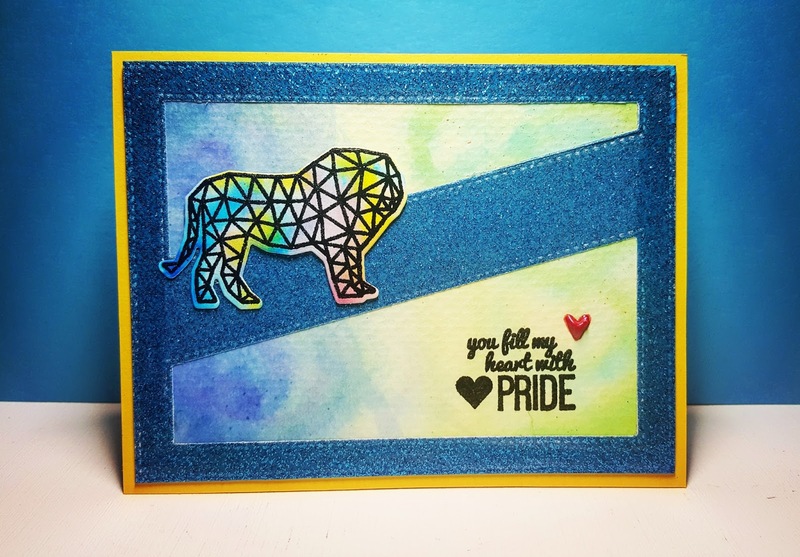 I used some bright blue glitter paper, mounted it on a panel I had water-colored some time ago (just waiting for the right project), then used other paper that I had water-colored for the Altenew Geometric Menagerie stamps/dies. 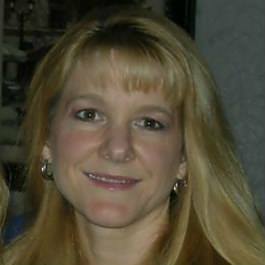 I heat embossed those images with WOW Black Glint (one of my favorite black embossing powders). 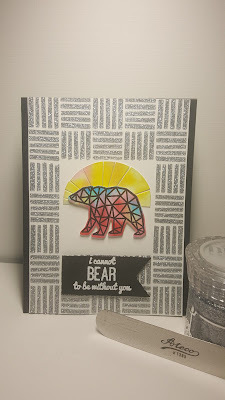 Used the same embossing for the sentiments found in the same Altenew stamp set. Added a few sequins and a glossy raised heart with Nuvo Crystal Drops. I hope you enjoyed my card creations for the class. I had fun using some new products and techniques. Soon I will post some foiled cards as I had the good fortune of winning one of the classes give-a-ways, the Gina K. designs Fancy Foils and Foil Mates and dies. Just waiting for their arrival!! 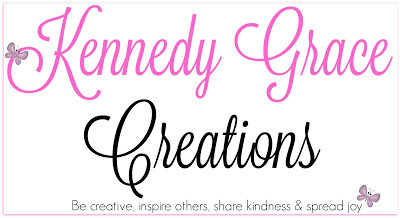 The Ton's August Challenge - My "Guest Designer" debut!